A complete range of complementary high-performance technology offerings designed to shape the future of trading. The Vela Stack delivers unique, ultra-low latency technology to power firms’ global, electronic trading activities. Available as a series of modular components, Vela's software enables access to all major asset classes and liquidity centers to successfully execute latency-sensitive trading strategies, manage risk and access data across multiple markets. Vela provides a range of flexible delivery options to achieve the scale, agility and operational efficiency required to be successful against a backdrop of increasingly global trading strategies, fragmented markets and continued pressures on capital. The Vela Stack delivers the performance, functionality and flexibility to maintain a lead in the marketplace by continually innovating, increasing agility and simplifying operations while navigating an ever-changing regulatory landscape. The Vela Ticker Plant is a software-based feed handling solution providing ultra-low latency, normalized access to over 250 venues, with global coverage and support for all major asset classes. Vela’s Execution Gateways are a software-based market access solution providing a normalized interface to trade on over 150 markets across all regions and asset classes. 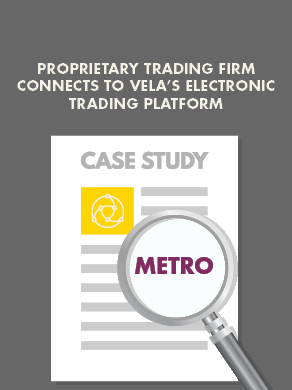 Vela’s Trading Platform, Metro, is a high-performant server-based system for customizable, latency sensitive automated and algorithmic trading strategies. Vela’s Risk and Analytics software provides comprehensive tools for real time control, monitoring and alerting of positions and exposure. Vela delivers our Software “as-a-Service” through a set of award-winning platforms allowing on-demand access to trading, data and risk APIs. Vela provides an end-to-end solution including software, infrastructure, operations and support, to simply connect and go. All Vela platforms are supported by our award-winning managed services team and 24x7 follow-the-sun support. Our Platform-as-a-Service offering allows quick and easy access to the trading, data and analytics APIs required for integration into front-office trading applications, for on-demand access to ultra-low latency trading and market access technology. Vela’s Market Data Feed, SuperFeed, is a fully hosted consolidated feed providing normalized access to multi-asset global markets. Vela’s DMA platform is a fully provisioned service to simplify the complexity of accessing global liquidity. Understand how Vela’s software and platforms address specific challenges and requirements across the various asset classes and use cases. MiFID II strives to improve the integrity and fairness of financial markets with a particular emphasis on ensuring clients adhere to best execution policies and that traditionally dark liquidity pools become more transparent. Vela delivers a comprehensive, full-service cryptocurrency solution by partnering with the industry’s leading crypto providers. Our platform delivers up-to-date, reliable and accurate data; fast electronic access; and smart order routing to crypto-asset trading exchanges.